July 9, 2013 Nefer Khepri, Ph. D.
I was very excited when I heard a deck based on Classic Maya, Aztec, Olmec, Toltec & Zapotec iconography and epigraphy (art and hieroglyphics) was being published. I have long desired to create such a tarot deck myself since my doctorate is in Latin American Studies with my specialty being the iconography and epigraphy of the Classic Maya. I enjoy the way the art was rendered in this deck: vibrant and bright colors against a black background. Many of the images I recognized from my work as a graduate student and my early days in academia. It’s lovely to see this artwork in a form that is now accessible to many more people than previously. The Star Road Map has a major arcana consisting of 22 cards, numbered 0 to 21. Cards 0 – 8 match their Tarot counterparts while cards 9 – 21 are all one off. For example, the Hanged Man, usually card # 12 is now # 11, Death is the 12th card, and so on with the Universe as card # 20 and Self Love as card # 21. 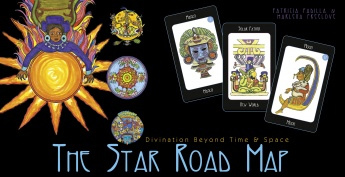 Despite the inclusion of a 22-card major arcana, The Star Road Map is not a tarot deck. It’s a similar divinatory system, yet also very different. The Star Road Map does not contain suits in the traditional sense. The first suit is the Cycle of Days. It consists of 20 cards modeled after the 20 day names of the Classic Maya tzolk’in calendar. The next suit is called Surfing the Overworlds. The ancient Mesoamericans (Maya, Olmec, Aztec, etc …) believed there were 13 levels of the physical world. Therefore, this suit contains a total of 13 cards, one devoted to each level of the Overworld, or the physical world in which we all live. The third suit is Navigating the Underworlds. Ancient Mesoamericans believed the underworld consisted of nine levels. As a result, this suit consists of nine cards, each one corresponding to a particular level of the underworld, or Xibalba, as it was known to the Classic Maya. The fourth suit is dedicated to the four cardinal directions that were of great spiritual importance to ancient Mesoamericans. Thus, this suit is called The Four Directions and consists of only four cards, each dedicated to a cardinal direction. Two additional directions, Above and Below (or Zenith and Nadir) were also of great importance to ancient Mesoamericans, but they are not included in The Star Road Map. The final suit is entitled Divine Intercession. It consists of nine cards representing powerful forces in the universe that can be invoked in times of trouble. 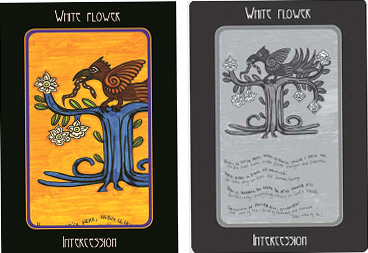 Card borders are black with the card name printed in white at the center top and center bottom (major arcana), and center top (suits). For those of you with small hands, the cards are stiff and can be somewhat difficult to shuffle the first few dozen times, but they do loosen up with loose. The laminate is slick, but the cards – even in the humidity of Houston – do not stick to one another. 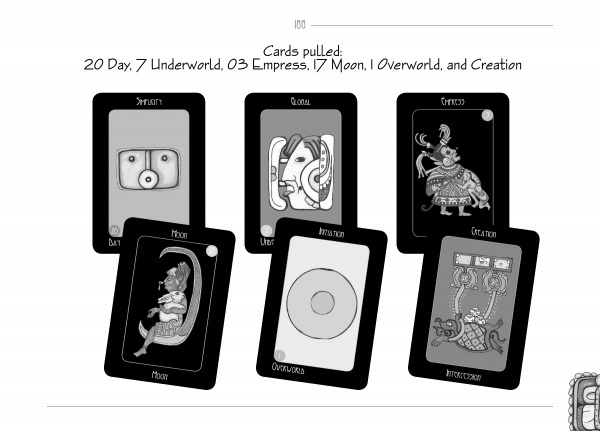 The book includes black and white images of each card with the majority of cards having two pages devoted to their interpretation. 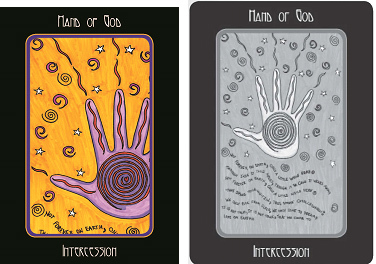 Card spreads consist of a one-card draw to contemplate for the day, a 3-card spread representing what the reader needs to be aware of, and a 6-card spread that represents a current issue and its lessons. The Deck In Action: Sample Reading. My regular readers will recall I have used other decks to ask if I would ever get another cat. I covered that as a question topic for my reviews of the Yuletide Lenormand and the Gilded Reverie Lenormand. I’m very happy to report that June 1st, Bluestar joined our family. At first, thinking she was a Russian Blue with a bit of tabby in her, my daughter named her after a character in the Warriors series of books. However, it turns out that Bluestar is a Charteaux, which is even more exotic and I’m pleased as punch I paid only $90 when such cats go for $800 – $1,000. Of course, she needed her shots updated and everything bought new for her, so she in reality cost me a few hundred dollars, but is worth more than her weight in gold. She’s brought us much joy. I used the 3-card spread from the guide book and received Moon, Akbal (a card of the Day suit), and Sun. In any reading, when it starts off with Moon and ends with Sun (or vice versa) that’s telling you that what lies between is along the spectrum of two extremes. Night and Day, or Day and Night. What these two cards immediately told me was that Bluestar went from one environment (the shelter) to another that was very different (our house). She did have a hard time adjusting to all the space she has here. At first she only stayed in my office for about 2 weeks before she began to venture out into the hallway and from there to other parts of the house. Moon denotes things of an emotional nature and I had been very emotional about finally getting another cat. I had been with a cat in my life since the age of 12, so when my cat Dickens died on 2/22/12 I was grieving for a few months, and then I needed time before I could entertain ideas of getting another cat. By spring of 2013 I was more than ready, but my husband was very hesitant so the idea of getting another cat became an emotionally charged issue for my family, which the Moon card indicates. Akbal is a day sign of the Classic Maya Tzolk’in calendar. Akbal means “darkness” and it can also mean “night” in Chol, a Maya language still spoken today in which the Classic Lowland Maya hieroglyphic inscriptions were written. Akbal is the third card of the suit of the Cycle of Days. It is entitled “Security” and means flexibility and letting go. The idea of relinquishing control is also stressed. The Sun represents success, good health, happiness, and achievement. The way I read Tarot, whenever the Sun appears as the outcome card to a reading the answer is always “yes.” The Sun’s placement here told me that Bluestar would eventually adjust wonderfully to us and I was not to worry. The Akbal card was telling me to stop worrying also, that Bluestar needed to feel secure in her new surroundings, and once she did a whole new cat personality would emerge. I did this reading 2 weeks ago in preparation for this review and I’m happy to report that Bluestar has completed her period of adjustment, that took her 3 weeks. She is best friends with our crazy Australian Red Heeler. Sheila didn’t know what to make of a friendly cat at first since Dickens had merely tolerated the poor dog for the 8 years of Sheila’s life. Bluestar and Sheila play the first two hours of everyday. They run through the entire house rampaging. Then they both crash for an hour long nap, then the rampaging resumes for another hour. The rest of the day they each do their own thing. Sheila has been very loving and understanding toward Bluestar while Bluestar has had to whip Sheila into shape a few times, but has never once extended her claws to the dog or any of us. She is proving to be a very affectionate and extremely playful cat and we’re all very happy to have her as a member of our family. The cards were right. I left her to her own devices and Bluestar has adjusted wonderfully well. Now the struggle becomes: who runs this house? Me or the cat? Right now she seems to think she does, but I have news for her. chilan. Technically speaking, he would have been a better choice for the Emperor card, so why Bird Jaguar was depicted, but then not mentioned anywhere in the discussion of that card is a mystery that I found to be intriguing. This in NO way detracts from the efficacy of the deck. If you are a deck collector, as I am, you my want a copy of the first edition of The Star Road Map. Should a subsequent edition be printed there are three cards that need to be corrected. The image on each of these three cards was cropped so that the upper quarter or right-hand third of the image is enlarged to cover the entire card surface while the rest of the image has been cropped off. You can see the entire image depicted in the guidebook. I noticed this when I first went through the deck and realized the image of the Nawal on the Nawal card had been beheaded. That caused me to compare the rest of the cards to their images in the guidebook and I found two more discrepancies. The Hand of God and White Flower cards also have been cropped and then enlarged to cover the card surface. 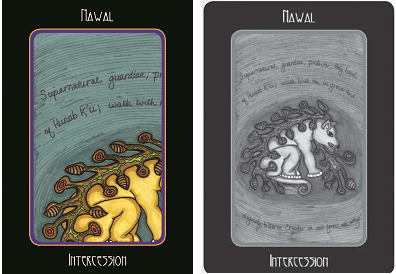 All three of these cards are part of the Divine Intercession suit. These three cards are a misprint, however, this in NO way detracts from The Star Road Map. In fact, in my opinion, it makes the deck more interesting. These partial images do not detract from the deck’s use as a divinatory tool and the entire image can easily be examined in the guidebook for those who wish to see it. Misprints are often valued by collectors in most cases and can even increase the popularity of a deck. Overall, once you get used to the different suits with differing numbers of cards, The Star Road Map is a fun deck to consult. It so far has given me accurate and insightful readings, and as I said in the beginning of this review, I am very happy to see the use of Classic Mesoamerican iconography throughout the deck and hope that this deck exposes people to the cultures depicted within. With lovely drawings and bold, vibrant colors against a black background, The Star Road Map is aesthetically pleasing and a pleasure to use. Previous Book Review: Dispelling Wetiko.